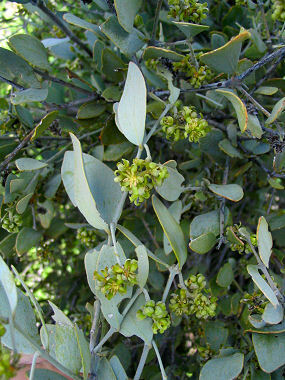 Jojoba (pronounced hoe-HOE-buh) is a member of the Box Fami ly. It appears as a woody evergreen shrub which grows from 2-5 feet in height. It has thick, leathery, grayish green leaves which are elliptical in shape and grow to 1.5 inches in length. It typically grows along washes and on dry rocky slopes at elevations between 1000 - 5000 feet. The plant blooms between December - July and produces small greenish yellow flowers which grow in dense clusters. Flowers are followed by a green acorn-like nut which grows to 1.5 inches in length. The plants are typically pollinated by the wind. A single jojoba will typically produce more than 2 pounds of pollen each year. Fortunately few people are allergic to it. Jojobas are draught deciduous, which means they will shed their leaves in response to draught conditions. 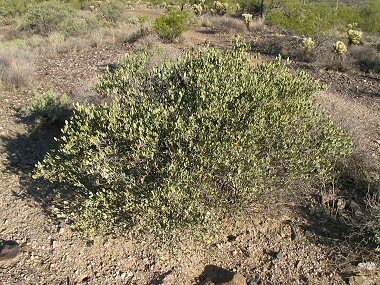 Leaves of the plant are browsed by deer, javalina and bighorn sheep while the nuts are eaten by small rodents and birds. The nuts contain a high percentage of a waxy oil which is used in some commercial applications including medicines and cosmetics. The plant is also commonly used as a landscape plant.